Directional vocabulary is an essential component to test prep! 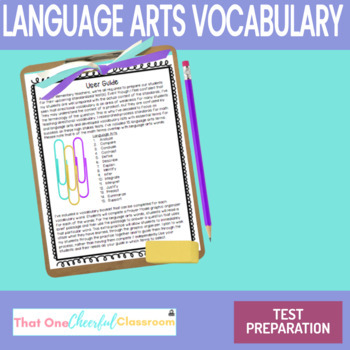 Teach 15 directional vocabulary terms through this test prep booklet. Upper elementary teachers throughout the country are required to teach students in order to succeed at a high stakes test at the end of the school year. Even though I feel confident that my students are well prepared with the actual content of the standards, I’ve seen that directional vocabulary is an area of weakness for many students. They may understand the content of a question, but they are confused by the terminology of the question. This is why I’ve decided to add a little focus to directional vocabulary. I’ve created a vocabulary booklet that can be completed for each vocabulary word. 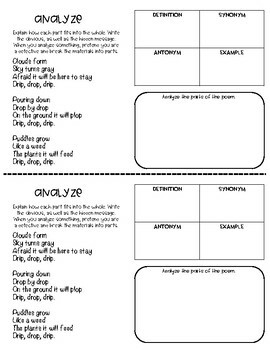 Students will complete a Frayer Model graphic organizer for each of the words. 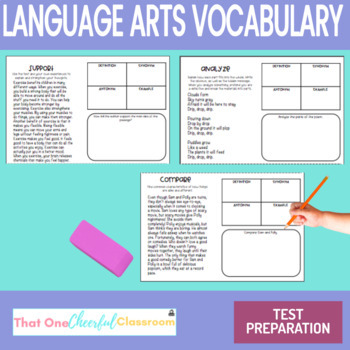 For the language arts words, students will read a brief reading passage and then use the passage to answer a question use that particular vocabulary word.